Safe for use on most surfaces. 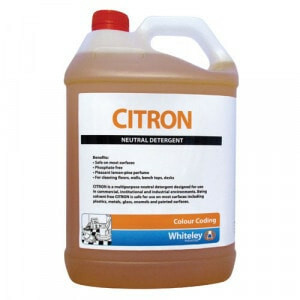 WHITELEY CITRON 5L Citron is a multipurpose neutral detergent designed for use in healthcare, commercial, institutional and industrial facilities. Citron rapidly emulsifies common food oils, mineral oils and synthetic oils. Citron is safe to use on most surfaces including: plastics, metals, stainless steel, ceramics, glass, enamels and painted surfaces. Citron can be used in any areas where soiling is a problem including floors, walls, bench tops, doors.